The former head of a Scottish fingerprint bureau has described one of Shirley McKie's most high-profile supporters as a "charlatan". 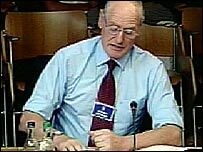 Retired Det Ch Insp Malcolm Graham, who was in charge of the Edinburgh office, criticised US expert Pat Wertheim while giving evidence to a Holyrood inquiry. 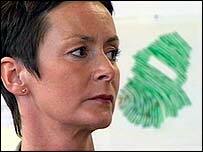 Several experts told MSPs no mistake had been made when a print at a murder scene was identified as Ms McKie's. But one forensic scientist disagreed and said there were 15 differences. John MacLeod, an independent fingerprint expert, was hired by the Scottish Executive when it faced legal action by Ms McKie. His report led to ministers awarding the ex-detective £750,000 in compensation. Ms McKie, from Troon in Ayrshire, was cleared of perjury after a print found at a murder scene in 1997 was wrongly identified as hers. Mr MacLeod's 29-page presentation explained why the print was not left at the murder scene by Ms McKie. He told MSPs on the parliament's Justice 1 Committee that just one clear difference in characteristics between two fingerprints was enough to rule out the possibility that they belonged to the same person. "To start with, there were three or four and I stopped then to do my first report and came up to talk the Scottish Executive through it," he said. "They asked me to go back and see how many faults there were, so I went back and did a second report which covers all the characteristics." He said the total was initially put at 16 but the figure had been amended to 15 because there was one difference that was not clear. Four fingerprint experts with the Glasgow-based Scottish Criminal Record Office (SCRO) identified the print as Ms McKie's and still maintain that it belongs to her. Mr Graham told MSPs he had "no doubt at all" that the print belonged to Ms McKie. He went on to attack the influence of Mr Wertheim, a fingerprint expert who gave evidence at her trial. "I seriously doubt Mr Wertheim's qualifications and experience," he said. "I think he lacks even the most basic knowledge of fingerprint work, and I am quite sure that at the time he was engaged by McKie he had no knowledge of fingerprints whatsoever. "I think he is an absolute charlatan." Alistair Geddes, one of the first experts to look at the print, told the committee he believed it was Ms McKie's print, even though he only found 10 points of comparison. And he said MSPs would be "amazed" at how often police officers' prints were found at a crime scene. "They walk in and it's as if they've got to touch something," he said. "As far I was concerned, this was another example of a police officer who didn't keep her hands in her pockets when visiting the locus." The committee also heard from Mike Thompson, head of the national fingerprint training centre at Durham. He said he and colleagues at the centre independently examined the fingerprints in 2000 and concluded the mark did not belong to Ms McKie.